Lloyd Cox does not work for, consult, own shares in or receive funding from any company or organization that would benefit from this article, and has disclosed no relevant affiliations beyond their academic appointment. This is the third in our series of explainers on key moments in the past 100 years of world political history. In it, our authors examine how and why an event unfolded, its impact at the time, and its relevance to politics today. You can read parts one and two here. John F Kennedy’s personal physician stated the cause of death was a gunshot wound to the head. This was officially announced to a stunned public half an hour later. The shock waves of the president’s assassination, the fourth in US history, continue to reverberate today. While the events of that day have been the subject of numerous conspiracy theories, the basic facts are now widely accepted. The president’s motorcade was making its way through Dealey Plaza in downtown Dallas when, five minutes from its destination, three shots rang out from behind and above the presidential limousine. Two of those shots found their mark, with the second being fatal. Texas’s Democratic governor, John Connally, who was seated immediately in front of the president, was also hit, though he would recover from his injuries. Seventy minutes after the attack, Dallas police arrested Lee Harvey Oswald, a former US marine who had spent three years in the Soviet Union. However, before Oswald could be properly questioned on his motives, less than 48 hours after the assassination of the president, Oswald himself was also dead. He was gunned down on live television by Jack Ruby, a Dallas nightclub owner with links to organised crime. This inspired generations of conspiracy theorists for whom the Kennedy assassination was an expression of unidentified malevolent forces threatening the United States. The impact of the assassination - speculations about a second gunman? One of the most ubiquitous and apparently plausible of the conspiracy theories floating around was that there was a second gunman, and that both he and Oswald were part of a wider circle of conspirators. 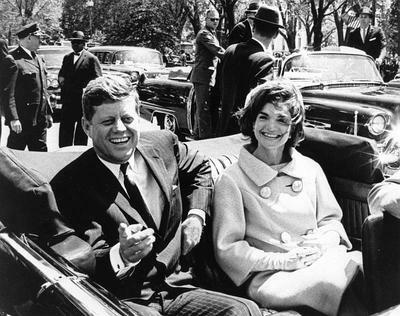 Despite the Warren Commission, which had been set up by new President Lyndon Johnson to investigate Kennedy’s murder, stating in September 1964 that Oswald was a “lone gunman” and was not part of any domestic or international conspiracy, this conclusion was not widely accepted until the mid 1970s. Several developments that cast doubt on the lone gunman thesis include a Senate Select Committee established to investigate “Governmental Operations with Respect to Intelligence Activities” in 1975. It asserted that investigations of the assassination by both the FBI and CIA had been deficient, and that some fundamental evidence had not been forwarded to the original Warren Commission. Furthermore, Abraham Zapruder’s now famous 26-second silent home movie of the killing was also released to public scrutiny in 1975. The heavily scrutinised final moments of Kennedy’s life. To the untrained eye, the film seems to show that the fatal second shot came from the front of the president’s car. His head snaps back and bodily matter is projected to the rear. Viewed in conjunction with conclusions from the Senate and House Committees, this was presumed by many to validate the claim that a second shooter had fired from the infamous “grassy knoll” to the right and front of the presidential cavalcade. Subsequently, the theory that a second assassin fired a fourth shot was conclusively falsified. The United States House Select Committee on Assassinations (HSCA) had acquired a police radio channel dicta belt recording of a motorcycle officer who had been part of the cavalcade. When this evidence was reexamined by independent acoustic research experts, they unanimously agreed that the apparent fourth shot was not a shot at all. Similarly, after reviewing the evidence, ballistic, forensic and medical experts have repeatedly drawn the conclusion that the entry and exit wounds on the president were consistent with having been shot from the rear rather than the front. So we can conclude with a very high degree of certainty that Oswald was the sole gunman who shot Kennedy. But it does not follow that the conception and planning of the assassination was that of Oswald’s alone. As a result of renewed interest generated by the Oliver Stone film, JFK, Congress passed the JFK Act in 1992. This led to the public release of over 4 million pages of documents pertaining to the assassination. It was on the basis of an exhaustive analysis of this material, in conjunction with all of the earlier government reports and secondary literature, that David Kaiser published the first book about the assassination written by a professional historian with all of the archival evidence available to him. The Road to Dallas: The Assassination of John F. Kennedy cites archival evidence that firmly links Oswald to a network of organised crime figures, anti-Castro Cubans and far-right political activists, all of whom had motives for wanting the president dead. While its conclusions are not watertight, the book’s judicious judgements provide the most compelling account yet that Oswald acted as part of a broader conspiracy. Kaiser’s essential argument is that a cabal of organised crime figures and anti-Castro Cuban exiles most likely recruited Oswald to be the trigger man in an attempt on the president’s life. The interests of organised crime figures, many of whom had had commercial operations in Cuba disrupted by the revolution, coincided with those of wealthy anti-Castro Cubans who had been exiled to the United States. Both groups were profoundly hostile to Kennedy and his brother, Attorney-General Robert Kennedy. Their administration had not only failed to invade Cuba and restore mob and Cuban private property, it had also waged a relentless campaign against particular organised crime figures. There is solid evidence that Oswald had direct or indirect contact with at least two such figures, while also being in contact with a wider group of anti-Castro activists. Kaiser surmises that the overlapping networks of mobsters and Cuban exiles hoped that the assassination of Kennedy, for which Oswald would be paid handsomely, would provoke a US invasion of Cuba and the restoration of their private property and commercial operations. This, of course, did not happen. Instead, there was a very different set of short and long term consequences. In the short term, the new president, Johnson, seized the opportunity offered by a nation’s grief to crush the Republican challenge at the 1964 election. He used that result as a mandate to vigorously pursue his liberal, Great Society programme and civil rights agenda, which greatly expanded the role of government and advanced the rights of African-Americans and other ethnic minorities. Longer term, it was Johnson’s liberal programme that provoked a conservative, white backlash that would gather strength under the presidencies of Richard Nixon and Ronald Reagan. In the 1968 and 1972 presidential elections, Nixon adopted his infamous “Southern strategy”. It deployed the coded racial language of “states’ rights” to split away white southerners from the Democratic Party whom they had traditionally supported. Nixon’s law and order rhetoric simultaneously appealed to the anxieties of what he claimed was a “silent majority”, who had been shaken by urban turmoil and the assassinations of John and Robert Kennedy, and Martin Luther King Jr. Respectable fears and the politics of race converged with paranoia stoked by conspiracy theories involving all of these assassinations. This white backlash and the realignment of many white working and middle class Americans to the Republican Party accelerated in the 1980s under President Reagan, and was consummated in the 2000s during the presidencies of George W. Bush and Barack Obama. A significant sub-section of white America could not reconcile themselves to the legitimacy of a black president after 2008. This expressed itself in the “birther” backlash against Obama, and the generalised hatred that greeted the new president from the political right. It is that same backlash, albeit taking new forms, that we today witness in the strange spectacle of Donald Trump’s presidency. Trump had been a central protagonist in the birther controversy, and has consistently played on race-based fears and prejudice to energise his supporters. Where once Nixon and Reagan spoke in the coded racial language of states’ rights, Trump now speaks in the forthright language of stopping Muslim immigration, kicking out Mexican murderers and rapists, and building walls between us and them. The vindictive, emotional politics of fear and rage is his standard currency. He has concentrated in his rhetoric and actions the most noxious elements of American politics in the half century that has passed since Kennedy’s untimely death. The political reverberations of the Kennedy assassination, then, continue to be felt in all sorts of unlikely ways. The paranoid, racialised and faux anti-elitist politics of the American right did not begin with the backlash against Kennedy and his administration. But his presidency and assassination, and the anxious political forces it set in motion, are an important milestone in their development. The American right today, with Trump as its figurehead, is the direct political descendant of this dark chapter in American history.